The mission statement of Rockin’ KR McNabs is to maintain and support the standards that the McNab family established, beginning with Alexander McNab and then later, his youngest son, John L. McNab. At Rockin’ KR McNabs, we strive to breed and raise dogs true to the origin of the Scottish Fox Collie and Basque Shepherd’s dogs that Alexander McNab crossed. This produces McNab Shepherds with a fine heads up stature, tight footed athletic qualities, a strong heading instinct, amazing herding ability, and deep loyalty. 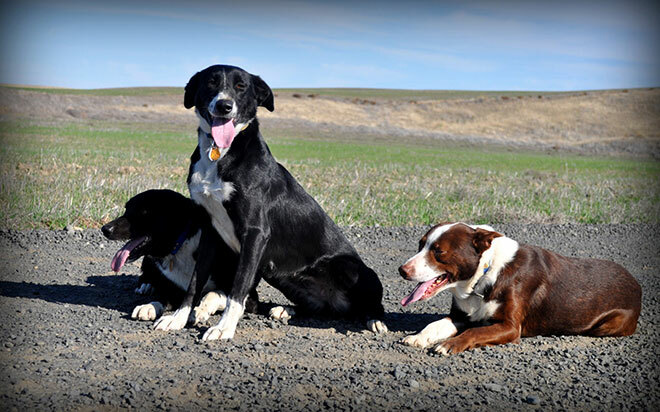 In classic McNab style, the dogs are predominantly black and white or red and white color. Occasionally a litter will include tri-colored McNabs. Most will have a white collar and either erect or drooped ears, either way is acceptable. The dogs will typically have sock feet. They are very intense in nature and yet are sweet companions. McNab Shepherds love sports Frisbee, flyball and agility and excel at hunting and have been trained as rescue and police dogs. Please enjoy our site and let us know if you need more information and would like to learn more about McNab Shepherds.